The long simmering tension between Erbil and Baghdad which resulted, on 16 October 2017, in open confrontation in Kirkuk and other disputed territories, has wiped out any trust between the Iraqi security forces – including the Popular Mobilisation Forces (PMF) – and the peshmerga, created over three years of fighting a common enemy in the Islamic State. The confrontation in Kirkuk and the breakdown of Kurdish defenses in the face of the Iraqi security forces’ onslaught has also had dire consequences for the stability in the Kurdistan region. The confrontation has split the peshmerga forces once again along party lines and threatened to undo years of hard work in trying to unify the forces of the two main ruling parties in the Kurdistan region. The checkpoints between the PUK and the KDP territories have been reinforced since the October confrontation. There have even been calls for the official division of the Kurdistan region into PUK and KDP territories. Party officials have accused each other on their TV channels of betrayal and being on the payroll of the enemies of the Kurds. The impact has been severe on the peshmerga forces which had been a key ally of the anti-ISIS coalition for over three years. The Kurdistan Democratic Party (KDP) of Masoud Barzani and the Patriotic Union of Kurdistan (PUK) have somewhere between 150,000 to 200,000 peshmerga fighters under their command, some of whom were used by the ruling parties to suppress the recent anti-government protests which occurred mainly in Sulaymaniyah province in December. Threatened by a common enemy, the peshmerga forces of the two ruling parties in the Kurdistan region and the Iraqi security forces engaged in unprecedented cooperation against ISIS militants as they swooped across northern Iraq in June 2014. Starting in Jalawla, in Diyala province, the peshmerga forces fought against ISIS with the help of the Iraqi security forces and the PMF, some with strong loyalty to Iran. This cooperation and coordination continued by and large throughout the war. This level of cooperation was unprecedented given that the prior to ISIS gains in the summer of 2014, the peshmerga forces and Iraqi security forces had locked horns for years following the overthrow of Saddam Hussein’s regime in 2003. The two forces came close to a full blown confrontation in 2012, a few months after the last American soldiers withdrew from Iraq. The situation became so serious that in 2013, the 14th and 16th Brigades of the Iraqi army, manned mainly by former peshmerga fighters, switched sides and joined the peshmerga command. However the war with Isis led to an unprecedented level of trust between Iraqi and Kurdish forces as well as between the peshmerga forces of the PUK and the KDP. The battle for Mosul, launched in October 2016, was correctly hailed as the peak of this new relationship between Iraqi and Kurdish forces. This could have set the foundation for future security cooperation between the peshmerga and Iraqi security forces in Nineveh, Kirkuk, Salahaddin and Diyala provinces: some of the the main flash points in Iraq. The remnants of ISIS have already started an assassination campaign against the Iraqi security forces in the west of Kirkuk in the Hawijah pocket. However, the end of the operations against ISIS in Iraq and the launch of the Kurdistan independence referendum as well as the oil and budget dispute between Baghdad and Erbil raised tension once again. The October 16 confrontation in Kirkuk ended the unity within the peshmerga and the cooperation between the Iraqi and peshmerga forces. The intense battle on October 20 in the town of Perde on the road from Kirkuk to Erbil, demonstrated the divided nature of the Iraqi security forces and the peshmerga. On the Kurdish side, only the KDP forces were present with a small but effective group of Iranian peshmerga. Two unified brigades of the Peshmerga ministry that took part in the battle consisted of only KDP peshmerga. The PUK peshmerga members of these two brigades had gone home to Sulaymaniyah. The forces lobbed hundreds of mortars and shells at each other that day. Both parties used arms provided by the anti-ISIS coalition against each other. 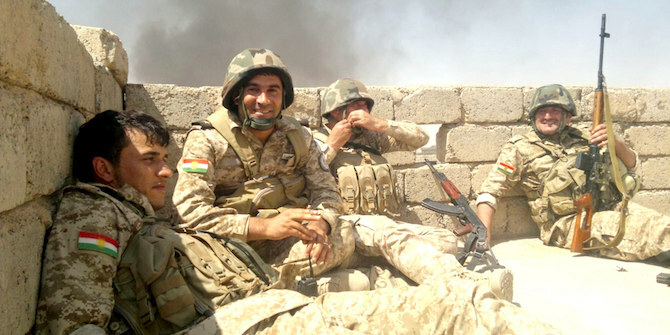 Dozens of peshmerga and members of the Iraqi security forces were killed in the battle. From 1992, when the Kurdistan Region was established, until 2006, the PUK and the KDP divided the region into two spheres of influence. In early 2006, the PUK and the KDP unified their administrations and agreed in writing to unify their security forces including the peshmerga forces. Under pressure from the Americans, the Kurdish leadership pledged to unify their forces but failed to do so. They finally agreed in 2010 to establish a unified peshmerga ministry. In 2011, the ministry started forming unified brigades consisted of the PUK and the KDP peshmerga fighters from Forces 70 and 80 which combined number around 100,000 peshmerga. By 2013, close to 28,800 peshmerga were brought together in 12 unified brigades according to a report from the peshmerga committee of the Kurdistan parliament in June 2014. While in practice these 12 brigades were divided on party line, for the first time, the PUK and the KDP peshmerga worked side by side in the same outpost and behind the same berm under one command, a significant step towards the unification of the peshmerga forces. However, the recent tension has put an end to that process and the peshmerga brigades are divided once again. The Kurdish authorities claim that they will continue working on the unification of the peshmerga forces assisted by military advisors from the US, UK and Germany who are helping the Kurds to reform the peshmerga ministry. If not resolved, the tension between Baghdad and Erbil could seriously threaten the stability of the Kurdistan region, the disputed territories and Iraq proper. With just over three months to go for the upcoming national and regional elections in Iraq and Kurdistan, the outcome of the elections which might shake the balance of power in the Kurdistan region, could determine whether the Kurds have any appetite to once again pursue the path of unification for the peshmerga forces as well as to resolve their differences with the central government.